The Daresbury Laboratory has developed a new highresolution silicon microstripbased instrument in collaboration with Cambridge and Southampton universities for the study of dynamic processes using realtime Xray spectroscopy. The XSTRIP detector system extends the scope of Energy Dispersive EXAFS instruments down to microsecond timescales, allowing better understanding of chemical reactions and phase changes, such as protein folding or the operation of catalysts. The data acquisition subsystem has been designed around a standard PC architecture using the Sundance modular solutions. This not only reduces the time and cost of development, but it also allows significant flexibility in the data processing architecture. The data acquisition continuously runs 32 channels of high-resolution 14-bit ADCs (four SMT356s run 8-ADC channels in parallel each) to digitise data at a rate of 160MSPS. Samples are then pre-processed in the SMT358 Virtex FPGA and stored into its 8MB of embedded ZBT SRAM, prior to be gathered to the fixed-point C6201 DSP on the SMT332. This data acquisition subsystem is mounted on two SMT310Q PCI carrier boards. These handle 320MB of data generated, and each of them provides four expansion sites for the two digitizer modules, the FPGA pre-processing and the DSP computation stages. The XSTRIP instrument has been completed after 18 months of engineering efforts and it has demonstrated high performance and flexibility for beamline 9.3 at the Daresbury Synchrotron Radiation Source. 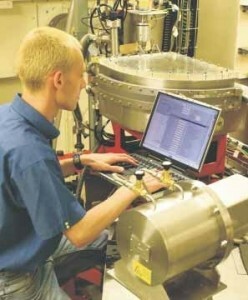 The system is up to 50 times faster than previous detector systems. XSTRIP has also been successfully tested at the European Synchrotron Radiation Facility (ESRF) in Grenoble, France.